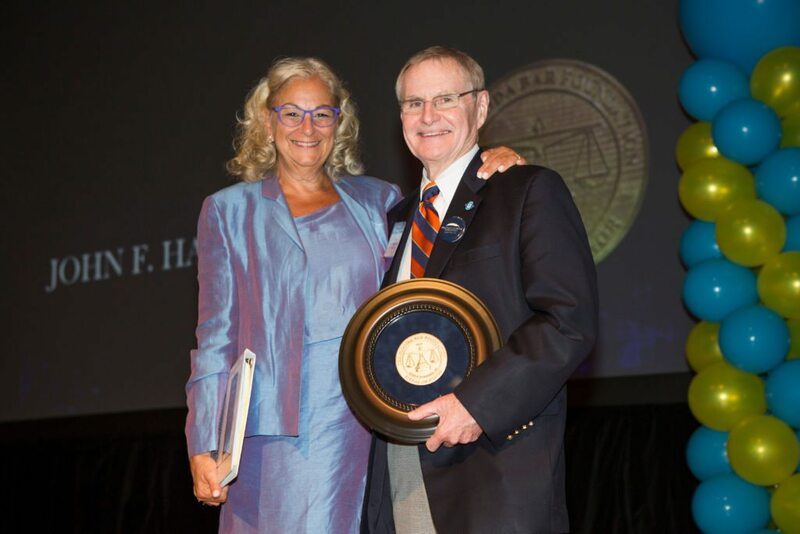 Florida Bar Executive Director John F. “Jack” Harkness Jr., a nationally recognized legal visionary and the nation’s longest-serving bar executive, received The Florida Bar Foundation’s 2017 Medal of Honor Award in the lawyer category June 22 at the Foundation’s annual dinner in Boca Raton. “Jack is the conscience, the brains and the heart of The Florida Bar. He has championed The Florida Bar Foundation, legal aid and pro bono service at every opportunity. 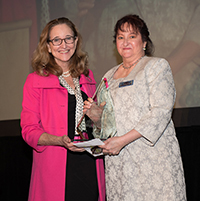 And he has done it the way he does everything: quietly and humbly, but nonetheless to great effect,” said Orlando attorney Ava Doppelt, who presented the award on behalf of Florida Lawyers Mutual Insurance Company, longtime sponsor of the Foundation’s highest award. After serving as the State Courts Administrator for six years, Harkness became executive director of The Florida Bar in 1980 when there were 27,713 members, a staff of 122 and an annual budget of $7.1 million. He now oversees a staff of 360 – with 284 working at the Tallahassee headquarters complex recently named in his honor – and a budget of $44.2 million for an organization with more than 105,000 members. 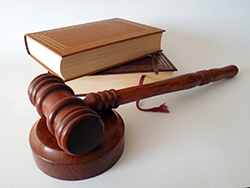 Among advancements critical to the legal profession’s success, Harkness is recognized for establishing the Bar’s ethics hotline, Attorney Consumer Assistance Program and countless other professionalism committees and programs of The Florida Bar. Harkness has been a strong advocate of pro bono service, legal services funding and a fair and impartial judiciary. In 2015, at the ceremony to name the Bar’s Tallahassee complex for Harkness, thenpresident Gregory W. Coleman said no single person has meant more to the legal profession and to Florida lawyers than Harkness. “He has been the guiding force behind every Florida Bar president and has made our bar the most recognized and influential in the country,” Coleman said.